A friend had managed to get us a reservation for the VAMPS X JOYSOUND special karaoke booth on August 28th 2015 at 10pm. 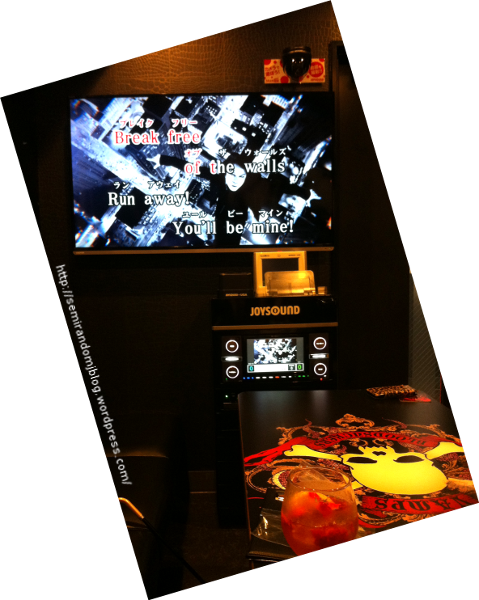 The VAMPS x JOYSOUND promotion ran between April and August 2015 in the JOYSOUND Karaoke Ginza, reservation only. It covered the room for an hour with a minimum of four people, and the choice of special drinks, each of them with a complementary special coaster. The price was ¥1788 per person, with one drink for each of us four. It started a bit rough because it was raining like hell and our friend was running late, but even if we started about 20 minutes later, we almost had 50 minutes, so it was not that bad. I had studied the drinks of the webpage, dictionary in hand on phone in order to know what I could drink, and eventually I had decided on the non alcoholic Jolly Roger. It did look as neat as in the picture, and tasted surprisingly nice. I got a nice coaster with it, too. This entry was posted in English, Showbiz-Entretenimiento, 日本国 and tagged karaoke, Tokyo-Ginza, VAMPS. Bookmark the permalink.